*** Limited time offer***. Book any available dates in January or February 2019 and I will credit you back 1/2 of the VRBO service fee. ** This is a legally zoned and licensed vacation rental in Moab**. This is a brand new, 3 bedroom, 2.5 bathroom upgraded townhouse. Sleeps up to 8 guests. Two car secure garage and long 35' driveway to park trailers and toys. Only a short 5 minute drive from the south end of downtown Moab. Located in the Rim Vista subdivision where the star gazing is excellent! Features: Granite throughout, new appliances including a gas stove, blendtec blender, washer and dryer, internet, bbq gas grill, air conditioning, seasonal pool and hot tub, basketball/ tennis court, play ground area. UPDATE: pool and hot tub will close mid October and reopen in March due to refurbishments. Master bedroom features a king bed, large closets, attached bathroom, large private deck area with amazing views, 50" smart TV. Bedrooms #1 and #2 feature Tuft and Needle memory foam queen beds, 40" smart TVs, dressers/ nightstands, and amazing views! Front room features a full size memory foam sleeper sofa, love seat, chair, 60" Smart TV, Blu ray disc player and beautiful views! This building, and many of the buildings on the street have obvious exterior surveillance cameras. There are no security cameras inside the condo or on the private balcony upstairs. Our family lives in Salt Lake and loves to travel and experience new places. The first time we visited Moab as a family, we fell in love with it and decided to set up a second home there. The Rim Vista's are close to town but just far enough away to create a truly peaceful and relaxing experience. At the end of the day, the kids love playing in the pool while we relax on the patio. The views are incredible and the two car garage is perfect for storing all your recreational equipment and toys. When we were looking for a place in Moab, I saw that this place was pretty popular, and after spending three nights there, I can see why. It was roomy, comfortable, and quiet. Everything seemed brand new. There was a ton of room for my wife and two teenage daughters. After spending the few nights prior in hotel rooms, we all enjoyed having our own space. The kitchen is very well appointed. It was easy to cook a few meals while we were there. It's about five minutes south of town, but that never seemed like far for us. You're going to be driving to almost everything in the area anyway. Heidi made the whole checkin process super easy. We didn't run into any issues, but if we had, I got the sense that she would have been there to help. I would definitely recommend staying here. We would plan/hope to stay here again in return trips to Moab! This is a beautiful place with more than you could think of needing and is just south of town but still close enough to drive to town, Arches, and Canyonlands. The.Beds.Are.So.Comfortable. We were also a big fan of the fluffy, furry blankets at the end of the day. The kitchen has everything you could possibly need although I'm not sure why you would want to do so much cooking :) - go out to explore! Owner was immediate in responding to any questions which is at the top of the list for using a rental. Super easy check in and check out. Couldn't ask for better stay! Beautiful condo in great location for national parks. 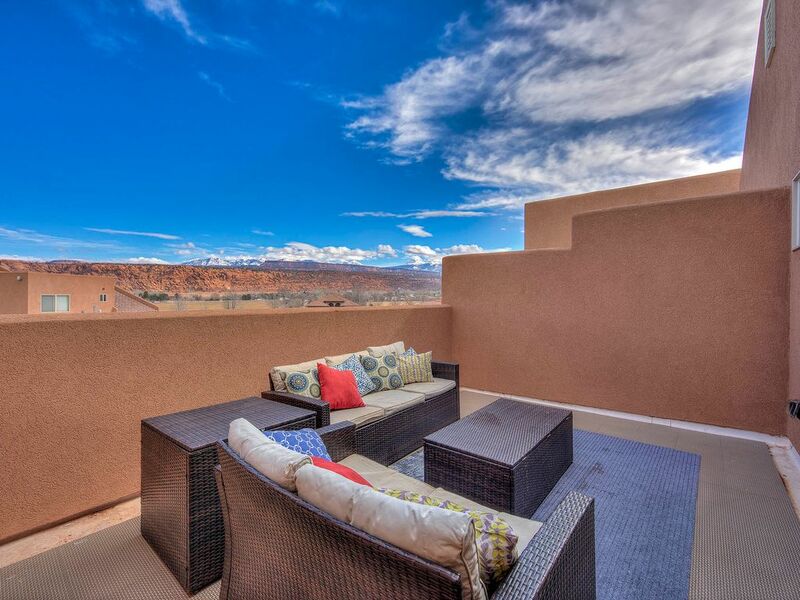 The beautifully appointed condo was easy to get to from the main road through Moab. First arrival was easy from the instructions left by the host. The bedrooms were spacious with the master bedroom being particularly grand. The kitchen, dining and living areas were well decorated and had everything we needed. We would definitely recommend this condo for anyone interested in this area. This is an amazing property in a beautiful part of the world. Everything is nearly new and very clean. This is the best stocked VRBO kitchen we've stayed in! The owner was attentive and made sure we had everything we needed. The design was great, with roomy bedrooms upstairs and a great open floorplan downstairs. I wish I could transplant this property everywhere we travel!!! Condo was amazing. Everything you needed was there. Awesome decor. Great place to stay. Beautiful condo with everything you needed. We enjoyed this home very much. It was our base for hiking Arches and Canyonlands national parks. The house was very clean and the master bedroom bed was comfortable. The weather really did not allow us to use the outside patios but they looked very nice. It was nice having access to a garage since we did have to deal with rain and muddy boots.